Use this option to request that a backup file be created the first time a file is saved. Subsequent Save operations will not disturb the backup file. If this option is unchecked, all other backup options are disabled. Use this option to request that a new backup file be written every time File | Save is performed. When this option is not selected, the backup file will be written the first time a file is saved, but not thereafter. 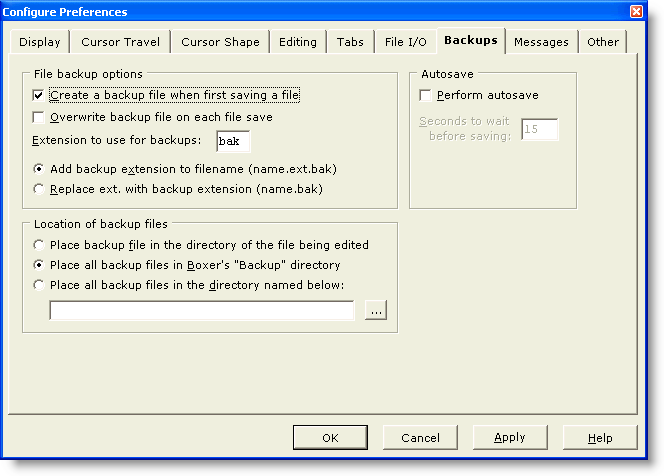 Use this option to specify the extension which is to be used for file backups. The extension can be 1 to 3 characters long. Use this option if you prefer that the backup file extension be added to the filename without removing any existing file extension. Use this option if you prefer that the backup file extension replace any existing file extension. Use this option to specify that backup files be placed in the same directory as the file being edited. The ellipsis (...) button can be used to browse for a directory using a standard dialog. Use this option to specify that all backup files be placed in the "Backup" directory (folder) which appears in Boxer's home (installation) directory. Use this option to specify that all backup files be placed in the directory name which is provided in the associated edit box. If you frequently edit files of the same name which exist in different directories, you may wish to choose that backup files be kept in the directory of the file being edited. Otherwise, if a common backup directory is used, it's possible that a backup file could be overwritten when later editing a file of the same name from within a different directory. For example, when editing the files c:\east\sales.txt and c:\west\sales.txt, the file which is saved second would be the one for which the backup file c:\boxer\Backup\sales.txt.bak applies. This option can be used to indicate that edited files be saved automatically after the supplied time interval has elapsed. When editing a new, untitled file (see File | New), the Autosave feature will be not be active until the file is saved for the first time, and a filename has been assigned. Use this option to specify the number of seconds after which Autosave should be performed. Caution: using a value which is too small could interfere with data entry when a very large file is being edited, or on very slow PCs.